The Zombie Dinosaur LP isn't going to bridge the gap between mc chris and the A$AP Mob, but Lars fans are sure to enjoy it. "You'll never meet an emcee who's more grateful for his fans," MC Lars raps on the opening track of The Zombie Dinosaur LP. Lars has good reason to be grateful. 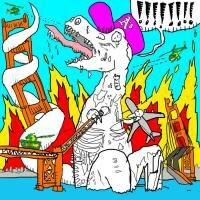 Zombie Dinosaur was funded through Kickstarter -- the third time Lars has crowdsourced album funds. Along the way he has not only cultivated a dedicated fan base, but he's racked up an impressive range of co-signs within the wider hip-hop ecosystem -- KRS-One, Kool Keith, Sage Francis, Mac Lethal -- and when he talks of them, it's not as marketing leverage or chest-thumping, just a dedicated fan pleased that he makes "KRS-One on my album music." And Lars shows his gratitude not just lyrically; he pops up on my Facebook feed periodically, seen hugging old friends after concerts. Lars splashed onto the burgeoning online music scene back in the mid-2000s with "Download This Song", an angry rap-as-screed against the music industry. He was among the first wave of artists to be labeled (often pejoratively) as "nerdcore", but that label has fallen by the wayside in some respects as lines blurred in the Internet-era and nerd culture made headway into mainstream rap: Game of Thrones has a mixtape series, El-P scored the credits for Fantastic Four, Adult Swim is years deep in its regular collaboration with rappers, and everyone in hip-hop from Open Mike Eagle to Chance the Rapper will profess their love for literature and video games. Zombie Dinosaur starts off with its strongest stretch of songs, and on these Lars shows that he can still write the hell out of some bars ("Poison when I spit it, komodo dragon / Nerdcore royalty, kimono draggin'"). He casually folds words like alacrity and loquaciousness into his flow -- the emcee equivalent of a juggler adding chunks of concrete to a routine. These tracks, standout "Zombie T-Rex" in particular, are also noteworthy in that their concept and content come from Lars's imagination. His creativity is immense, and giving himself a blank canvas serves him well, allowing him to bend anywhere in the service of good writing and flow instead of struggling to paint within the lines of whatever big tent Nerd™ topic he's chosen: Game of Thrones ("Dragon's Blood"), Roger Rabbit ("The Dip"), Simpsons ("The Ballad of Hans Moleman"), etc. This struggle to stay true to a narrow range of subject matter leads to moments on the cringier side of the spectrum, e.g. "Dead Kennedys, bought a ticket to see Jello / But he wasn't there, and I was like 'hello!'" from the admittedly on point "Sublime with Rome (Is Not the Same Thing as Sublime)". "Hipster Mom" is an in between example -- Lars doesn't seem hemmed in by the topic, but the song's impact is slightly muted. It's akin to Watsky's "Kill A Hipster (Save Your Hood)", but whereas Watsky put his song in first person and flirted with the line of self-identification ("I gentrified the corner store just buying hot chips"), Lars stays on the outside, toeing the empathetic line while throwing out stereotypes and dipping into mocking on the voice-over lines. For longtime Lars fans, there aren't any real surprises on Zombie Dinosaur. His genre-shifting compositions, lighthearted observations, and nerd-tilted subject matter are all intact. There are also some great nuggets to be mined for rap fans with broader tastes -- an interpolation of Eminem's verse from "Forgot About Dre", for example, or the most LOL-worthy moment of all: calling Daenerys Targaryen "Wiz Khaleesi." In other words, it's an MC Lars record through and through, and this works both for and against him. The chuckles-per-track metric remains steady, but the tone lands as inconsistent, rendering Zombie Dinosaur an album of isolated moments and a great CV for Lars's production talents. It's not going to bridge the gap between mc chris and the A$AP Mob, but it's another entry in a growing discography that fans are sure to enjoy.